Method Preheat oven to 350°. If you are not using pre-washed packaged spinach, wash spinach very well and dry. Cut off stems and chop. Place in a large bowl and add chopped spring onion, chopped dill, feta and eggs. Using your hands mix well until all ingredients are fully combined. Season with salt and pepper. Melt the butter and brush a little onto a 9 x 12 baking dish. Open your fill0 package and lay them flat in between a clean damp cloth folded in half. Place two fill0 sheets on the bottom of your baking dish and brush with butter. Make sure to keep your fillo sheets covered at all times to keep them from drying out. Continue placing two sheets at a time and brushing with melted butter until you have a good bottom base, approximately 10-12 sheets. Put your spinach filling in and continue layering fillo two sheets at a time and brushing with butter for another 12 sheets. I create a little more dramatic top by folding the fillo as you would a fan and placing them on top to fully cover. Drizzle the remaining butter on top and place in over for approximately 30 minutes until the top is well browned. Serves 4-6 as a side dish buon appetite. Looks wonderful. Doesn’t look too hard to put together. Love the look of the folded filo on top. It adds mystery. I think you will be pleased with the homemade version. It’s actually fun to make too! I don’t think I have ever eaten Spanakopita, but I adore spinach, and I am sure I would love this. Thank you for sharing the recipe! You are welcome. I hope you consider trying this, it is so good. Yes. Probably because most often the spinach is either frozen first or washed and not dried. Sorry to hear you have a fillo trauma. Thank you! Greek food… I cook them, and I love them, even before I met my Greek husband. The best spanakopita I had was at a Greek family gathering -a senior of the family brought it- and was like yours. I have tried it in triangles several times, but I will try them in big dish next time. Hi Fae. I love Greek food so much. I do like spanakopita in triangles too, it does present a little more work though. Hope you try it this way, you’ll see it is very easy and so delicious. Oooh, a lot of favorites in this post! Greece is high on my travel destination list, and spanakópita is high on my “foods I want to try to make, but I am a little intimidated” list. Very inspiring! I have so many foods I am intimidated to make too! I really think if you try this one you’ll see it really isn’t too difficult. :) Just keep the fillo humid! I LOVE spanakopita, I always cooked the spinach filling but you are right, the baking time in the oven is sufficient. Your recipe is simple and looks so delicious. So true. Like you I do not like to cook the goods out of the vegetables! We love spanokpoita too and make it often. Melbourne has the largest Greek population outside Greece, so the delicious food is everywhere. Fortunately it has not strayed far from its roots. Thank you for this…..it’s now 9:30pm and all I can think about is sinking my teeth into some hot spinach pie! Isobel… I went to your blog and was truly moved by your photographs and especially the post for your mom. Thank you for stopping by and taking the time to comment on the spanakópita recipe. :) Your little Poppy is absolutely adorable! I really do enjoy spanakópita. I was lucky enough to tour a few of the Greek Islands, where I learned each Island has its own spanakópita. Well, that’s all I needed to hear. I made sure to sample the spinach pies wherever we went. And I loved each one! I never made it to Siphnos, though, so I guess I’ll have to make your tasty spanakópita. Thanks for sharing! I remember trying many variations too. I didn’t particularly care for the pies which were too oily and flat. However, if you can not go wrong with the combination of spinach and feta! :) Thank you for your comment! Aren’t the Greek Islands magnificent? your picture is making my mouth water. Love the pie crust and the ingredients are awesome. I love spanakopita and your looks truly divine!! 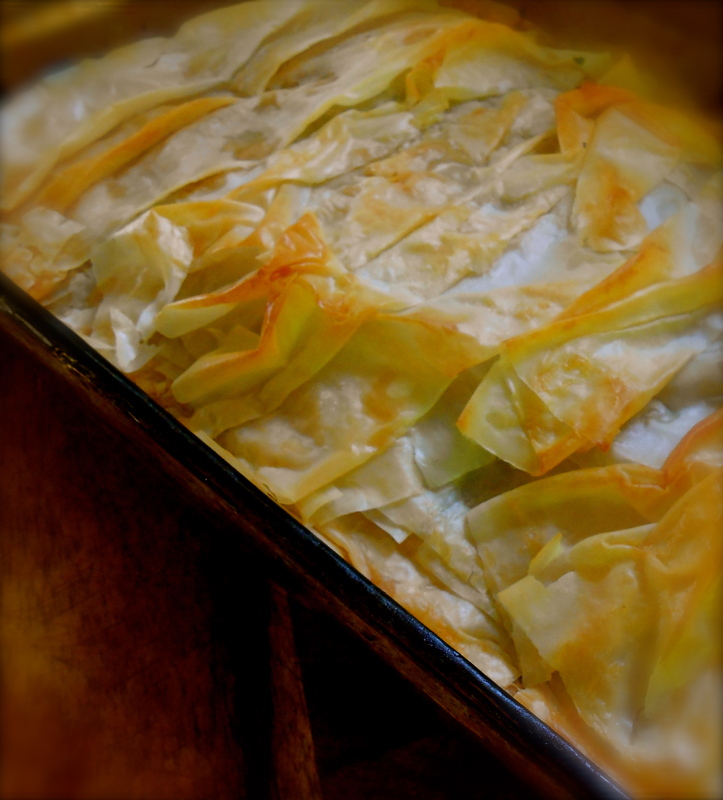 That golden phyllo crust, mmmm… I could just crunch into that right now if I could! I have to admit my husband usually uses the frozen boxes of spinach, squeezing out the extra liquid (it was actually the form of spinach listed in the recipe in a Greek cookbook we have!). I will have to pass on this recipe to him so he can give the fresh spinach a try! I would love it if your made this because you would be so pleasantly surprised how easy it is to prepare and how delicious. This crispy fillo dough is light, a very nice pie for breakfast too. I can imagine how wonderful your memories of Greece were. Gathering around food in a quaint taverna. I didn’t get to experience that from my travel in Italy since I had to cut my trip short. There is a cafe in Wellington where I first discovered Spanakópita. I would go there frequently just to order a piece of this lovely pie. They would serve it with yogurt but I would not have any of it. Spanakópita is wonderful by itself. At least for me! I usually eat it without yogurt too, although I do really love it with the tzaziki. I would love to go to Italy. It’s my favorite food and I have not been. Thank you so much! And thank you for visiting too. You are currently reading spinach pie (spanakópita) at COTTAGE GROVE HOUSE.